Inevitably I am going to have to write a blog about food and to be honest; I have been postponing it for way too long. Not at all because I don’t like he food here, quite the contrary because I can’t figure out how to write it and how to account for all of the amazing food here. So I will do it in stages and in the spirit of this blog, give each dish its own story. “ Ladies, Breakfast is on the table” my Dad yells from the kitchen, the sound resonating up through the narrow stairwell of their house in Germany. My mother and I trudge downstairs, our stomachs rumbling, eager for the hot coffee and the delicious food my father has surely cooked. We stop dead at the doorway as soon as we smell the fermenting rice and see my father at the stove, expertly removing the flat shallow tray with small depressions that are filled with piping hot, steamed rice balls. Oh no. 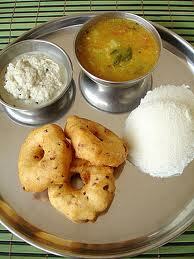 Idli. Not Again. My mother secretly rolls her eyes and I let out an exasperated sigh. Somehow my Dad has found a liking for these dry, sour-tasting balls of steamed fermented rice from South India and is convinced that we share his taste. “Did you make anything else?” I inquire, trying not to sound too much like a whiney spoiled child. I swear I see him do the little Indian head bob. It is times like these I wish I had normal parents. 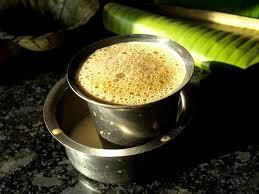 On my way to work I buy a South Indian coffee. South India coffee is quickly becoming my favorite kind of coffee. It is generally about 80% coffee ( Arabica I think they grow here) and 20% chicory which gives it this delicious, nutty, caramel flavor. Their coffee made the original way (read non-instant) is as following. The coffee-man will brew a small but really potent espresso-like shot of coffee and add this to hot, full-fat milk in a kind of metal bowl. He will then pour, back and forth between the bowl and small metal tumbler until it is cool enough to drink and has this delicious, frothy layer on top. To this they add about 3 spoonfuls of sugar, probably adding to its deliciousness factor. I wish I had a normal family too!! I miss REAL indian food. can we perfect our sambar, dosa and idli recipes please??? Thanks. Come live with me.